166 rational pages of science that read like a blood-curling thriller? This exceptional book should be mandatory reading for all (future) parents. Or anyone who likes to keep their marbles. I have written about some of the most dangerous neurotoxins (and ways to try and avoid them) earlier. And I think that the book I talk about today should have caused a lot more public discourse. Written by a leading independent environmental health expert, it showcases, with scientific precision and a lot of passion for the topic, the massive dangers of industrial chemicals and the amount of ignorance, arrogance and unwillingness to act from the side of those who have the ability and the responsibility to protect the people and the environment. The edition I review here is the 2013 hardcover (€26; first edition 2008). Philippe Grandjean: Professor and Chair of Environmental Medicine at the University of Southern Denmark and Adjunct Professor of Environmental Health in the Department of Environmental Health at Harvard School of Public Health, co-editor-in-chief of the journal Environmental Health. He has devoted his career to studying environmental chemicals and their effect on children and brain development. The reaction to his studies on mercury (do you remember that mercury pollution comes from conventional gold mining?) led to a United Nations mercury pollution agreement. 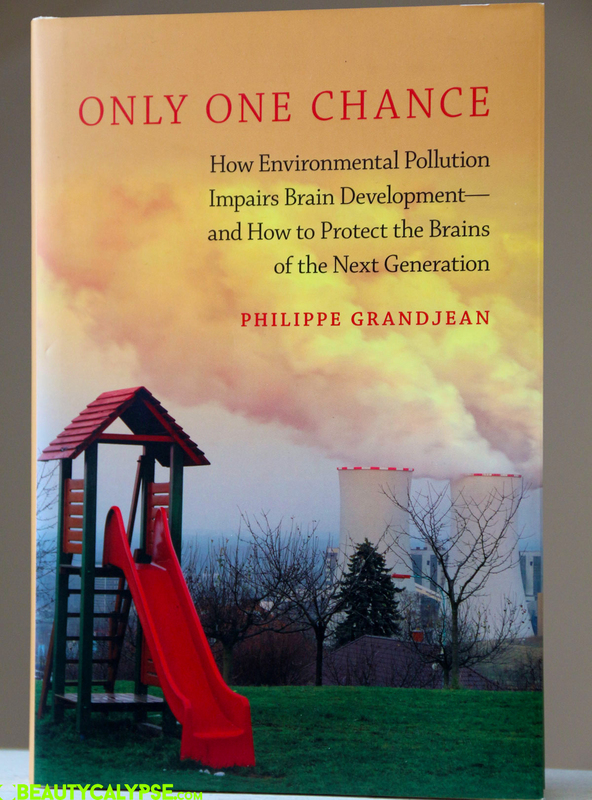 The title refers to the (worrying) fact that a person’s brain has only the eponymous one chance to develop. The chemical damage can be done as soon as to the fetus for, and the title of chapter 2 gives it away “the placenta is not a protective armor”, and influence the person’s entire life. It’s indisputable that such conditions profoundly affect the quality of life. And while the culprits are well known and their effect on adult brains is proven, there is little to no action when it comes to regulating the emissions of/exposure to mercury, polychlorinated biphenyls (PCBs), arsenic, and certain pesticides. Understanding the goldfish attention span of our minds exposed to a constant media stream, Grandjean has given the developmental neurobiological damage caused by (industrial) neurotoxins a funky name: brain drain. Brain drain is what happens to the highly complex organ that is a human brain when it’s exposed to chemicals designed to make our modern lives better and used across industries from agriculture to mining. And let’s not forget about the highly toxic tobacco and alcohol that are still on the fun and happy side of our perception. Grandjean advocates and rationally documents why the burden of proof should fall on industry – NOT on consumer safety groups. He argues that chemical safety is not proven by the mere absence of evidence and proves that corruption is very much at play. Grandjean also describes smear campaigns against scientists and the atmosphere of fear that influences the communication of scientific findings that might not be applauded for by the industry. If you read terms like “junk science”, “loose science” or “science-challenged alarmists”, be sure – this is another round of Vested Interest Bingo. The author has a website dedicated to the problem – Chemical Brain Drain. I found the book profoundly moving and a true page-turner. It’s written in such a clear and rational way, and yet you feel the author’s genuine compassion, his deep concern with how we never learn from our mistakes (example: lead poisoning story and the hard, long and not even finished road to banning lead). […] I should admit to having a nightmare. […] I watch as we keep releasing toxic chemicals, each of which carves a tiny part of our brain power. […] In the end, our brains are reduced until nothing is left. And finally, the last – but not the least important – bit of information waits for the reader in the Appendix: a list of 213 chemicals known for causing negative effects on the human nervous system, including high-production volume toxins. The list spans metals and inorganic compounds (such as aluminium, arsenic, lead, mercury), organic solvents (acetone, benzene, styrene, xylene), organic substances (aniline, ethylene, phenol), and pesticides. I highly recommend this book because here’s a real luminary speaking on such a vital matter. Just as we look today in disbelief at the deadly Victorian homes, one day our children will look back at us. Let’s make it a proud look. One Chance Only, Kindle Edition. This is so terrifying. Is there a German translation?? Ich fürchte, nein. Es gibt nur eine Übersetzung ins Französische. Aber man kommt auch mit Schulenglisch zurecht, Grandjean schreibt sehr klar. I am worried I might give myself nightmares reading the book. ‘A continuation of this nightmare includes the “historical amnesia”, our common inability (or unwillingness) to learn from past experience–in this case, regarding environmental toxicants.” Historical amnesia …….why are we so good at it! Historical amnesia is a thing, isn’t it?